A widely scattered family, originally from Provence, not from Oran ("d'Oran"), as some scholars think. 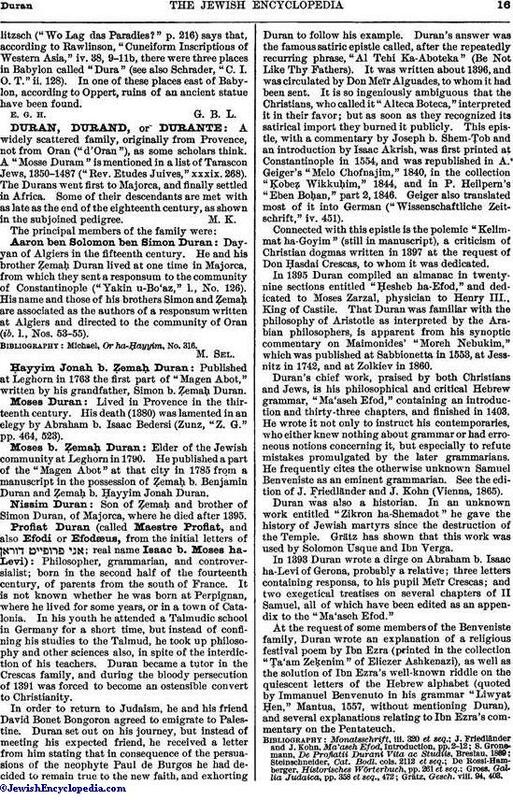 A "Mosse Duram" is mentioned in a list of Tarascon Jews, 1350-1487 ("Rev. Etudes Juives," xxxix. 268). The Durans went first to Majorca, and finally settled in Africa. Some of their descendants are met with as late as the end of the eighteenth century, as shown in the subjoined pedigree. Dayyan of Algiers in the fifteenth century. He and his brother Ẓemaḥ Duran lived at one time in Majorca, from which they sent a responsum to the community of Constantinople ("Yakin u-Bo'az," 1., No. 126). His name and those of his brothers Simon and Ẓemaḥ are associated as the authors of a responsum written at Algiers and directed to the community of Oran (ib. 1., Nos. 53-55). Published at Leghorn in 1763 the first part of "Magen Abot," written by his grandfather, Simon b. Ẓemaḥ Duran. Lived in Provence in the thirteenth century. His death (1380) was lamented in an elegy by Abraham b. Isaac Bedersi (Zunz, "Z. G." pp. 464, 523). Elder of the Jewish community at Leghorn in 1790. He published a part of the "Magen Abot" at that city in 1785 from a manuscript in the possession of Ẓemaḥ b. Benjamin Duran and Ẓemaḥ b. Ḥayyim Jonah Duran. Son of Ẓemaḥ and brother of Simon Duran, of Majorca, where he died after 1395. Philosopher, grammarian, and controversialist; born in the second half of the fourteenth century, of parents from the south of France. It is not known whether he was born at Perpignan, where he lived for some years, or in a town of Catalonia. In his youth he attended a Talmudic school in Germany for a short time, but instead of confining his studies to the Talmud, he took up philosophy and other sciences also, in spite of the interdiction of his teachers. Duran became a tutor in the Crescas family, and during the bloody persecution of 1391 was forced to become an ostensible convert to Christianity. In order to return to Judaism, he and his friend David Bonet Bongoron agreed to emigrate to Palestine. Duran set out on his journey, but instead of meeting his expected friend, he received a letter from him stating that in consequence of the persuasions of the neophyte Paul de Burgos he had decided to remain true to the new faith, and exhorting Duran to follow his example. Duran's answer was the famous satiric epistle called, after the repeatedly recurring phrase, "Al Tehi Ka-Aboteka" (Be Not Like Thy Fathers). It was written about 1396, and was circulated by Don Meïr Alguades, to whom it had been sent. It is so ingeniously ambiguous that the Christians, who called it " Alteca Boteca," interpreted it in their favor; but, as soon as they recognized its satirical import they burned it publicly. This epistle, with a commentary by Joseph b. Shem-Ṭob and an introduction by Isaac Akrish, was first printed at Constantinople in 1554, and was republished in A. Geiger's "Melo Chofnajim," 1840, in the collection "Ḳobeẓ Wikkuḥim," 1844, and in P. Heilpern's "Eben Boḥan," part 2, 1846. Geiger also translated most of it into German ("Wissenschaftliche Zeitschrift," iv. 451). Connected with this epistle is the polemic "Kelimmat ha-Goyim" (still in manuscript), a criticism of Christian dogmas written in 1397 at the request of Don Ḥasdai Crescas, to whom it was dedicated. In 1395 Duran compiled an almanac in twenty-nine sections entitled "Ḥesheb ha-Efod," and dedicated to Moses Zarzal, physician to Henry III., King of Castile. That Duran was familiar with the philosophy of Aristotle as interpreted by the Arabian philosophers, is apparent from his synoptic commentary on Maimonides' "Moreh Nebukim," which was published at Sabbionetta in 1553, at Jessnitz in 1742, and at Zolkiev in 1860. Duran's chief work, praised by both Christians and Jews, is his philosophical and critical Hebrew grammar, "Ma'aseh Efod," containing an introduction and thirty-three chapters, and finished in 1403. He wrote it not only to instruct his contemporaries, who either knew nothing about grammar or had erroneous notions concerning it, but especially to refute mistakes promulgated by the later grammarians. He frequently cites the otherwise unknown Samuel Benveniste as an eminent grammarian. See the edition of J. Friedländer and J. Kohn (Vienna, 1865). Duran was also a historian. In an unknown work entitled "Zikron ha-Shemadot" he gave the history of Jewish martyrs since the destruction of the Temple. Grätz has shown that this work was used by Solomon Usque and Ibn Verga. In 1393 Duran wrote a dirge on Abraham b. Isaac ha-Levi of Gerona, probably a relative; three letters containing responsa, to his pupil Meïr Crescas; and two exegetical treatises on several chapters of II Samuel, all of which have been edited as an appendix to the "Ma'aseh Efod." At the request of some members of the Benveniste family, Duran wrote an explanation of a religious festival poem by Ibn Ezra (printed in the collection "Ta'am Zeḳenim" of Eliezer Ashkenazi), as well as the solution of Ibn Ezra's well-known riddle on the quiescent letters of the Hebrew alphabet (quoted by Immanuel Benvenuto in his grammar "Liwyat Ḥen," Mantua, 1557, without mentioning Duran), and several explanations relating to Ibn Ezra's commentary on the Pentateuch. Grätz, Gesch. viii. 94, 403. Rabbi in Algiers, 1531; grandson of Simon ben Ẓemaḥ. He and his brother Ẓemaḥ are the authors of the responsa which appeared under the title "Yakin u-Bo'az," Leghorn, 1782, the fifty-one responsa printed in the second part ("Bo'az") being Simon's work. His liturgical poems (nine dirges) still exist in manuscript (Zunz, "Literaturgeschichte der Synagogalen Poesie," p. 534). 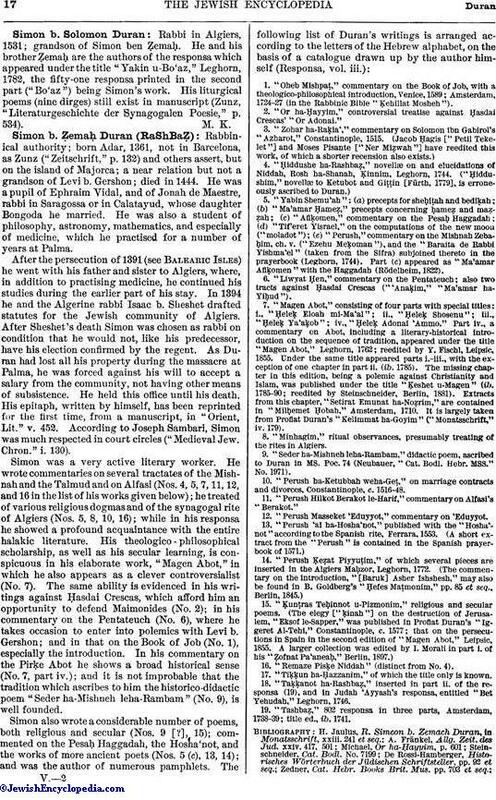 Rabbinical authority; born Adar, 1361, not in Barcelona, as Zunz ("Zeitschrift," p. 132) and others assert, but on the island of Majorca; a near relation but not a grandson of Levi b. Gershon; died in 1444. He was a pupil of Ephraim Vidal, and of Jonah de Maestre, rabbi in Saragossa or in Calatayud, whose daughter Bongoda he married. He was also a student of philosophy, astronomy, mathematics, and especially of medicine, which he practised for a number of years at Palma. After the persecution of 1391 (see Balearic Isles) he went with his father and sister to Algiers, where, in addition to practising medicine, he continued his studies during the earlier part of his stay. In 1394 he and the Algerine rabbi Isaac b. Sheshet drafted statutes for the Jewish community of Algiers. After Sheshet's death Simon was chosen as rabbi on condition that he would not, like his predecessor, have his election confirmed by the regent. As Duran had lost all his property during the massacre at Palma, he was forced against his will to accept a salary from the community, not having other means of subsistence. He held this office until his death. His epitaph, written by himself, has been reprinted for the first time, from a manuscript, in "Orient, Lit." v. 452. 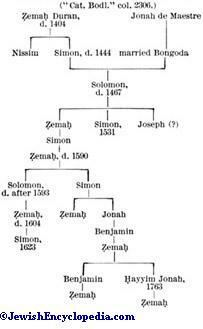 According to Joseph Sambari, Simon was much respected in court circles ("Medieval Jew. Chron." i. 130). Simon was a very active literary worker. He wrote commentaries on several tractates of the Mishnah and the Talmud and on Alfasi (Nos. 4, 5, 7, 11, 12, and 16 in the list of his works given below); he treated of various religious dogmas and of the synagogal rite of Algiers (Nos. 5, 8, 10, 16); while in his responsa he showed a profound acquaintance with the entire halakic literature. His theologico - philosophical scholarship, as well as his secular learning, is conspicuous in his elaborate work, "Magen Abot," in which he also appears as a clever controversialist (No. 7). The same ability is evidenced in his writings against Ḥasdai Crescas, which afford him an opportunity to defend Maimonides (No. 2); in his commentary on the Pentateuch (No. 6), where he takes occasion to enter into polemics with Levi b. Gershon; and in that on the Book of Job (No. 1), especially the introduction. In his commentary on the Pirḳe Abot he shows a broad historical sense (No. 7, part iv. ); and it is not improbable that the tradition which ascribes to him the historico-didactic poem "Seder ha-Mishneh leha-Rambam" (No. 9), is well founded. 1. "Oheb Mishpaṭ," commentary on the Book of Job, with a theologico-philosophical introduction, Venice, 1589; Amsterdam, 1724-27 (in the Rabbinic Bible "Ḳehillat Mosheh"). 2. "Or ha-Ḥayyim," controversial treatise against Ḥasdai Crescas' "Or Adonai." 5. "Yabin Shemu'ah": (a) precepts for sheḥiṭah and bediḳah; (b) "Ma'amar Ḥameẓ," precepts concerning ḥameẓ and maẓẓah; (c) "Aflḳomen," commentary on the Pesaḥ Haggadah; (d) "Tif'eret Yisrael," on the computations of the new moon ("moladot"); (e) "Perush," commentary on the Mishnah Zebaḥim, ch. v. ("Ezehu Meḳoman"), and the "Baraita de Rabbi Yishma'el" (taken from the Sifra) subjoined thereto in the prayerbook (Leghorn, 1744). Part (c) appeared as " Ma'amar Aflḳomen" with the Haggadah (Rödelheim, 1822). 7. "Magen Abot," consisting of four parts with special titles: i, "Ḥeleḳ Eloah mi-Ma'al"; ii., "Ḥeleḳ Shosenu"; iii., "Ḥeleḳ Ya'aḳob"; iv., "Ḥeleḳ Adonai 'Ammo." Part iv., a commentary on Abot, including a literary-historical introduction on the sequence of tradition, appeared under the title "Magen Abot," Leghorn, 1762; reedited by Y. Fischl, Leipsic, 1855. Under the same title appeared parts i.-iii., with the exception of one chapter in part ii. (ib. 1785). The missing chapter in this edition, being a polemic against Christianity and Islam, was published under the title "Ḳeshet u-Magen" (ib. 1785-90; reedited by Steinschneider, Berlin, 1881). Extracts from this chapter, "Setirat Emunat ha-Noẓrim," are contained in "Milḥemet Ḥobah," Amsterdam, 1710. It is largely taken from Proflat Duran's "Kelimmat ha-Goyim" ("Monatsschrift," iv. 179). 8. "Minhagim," ritual observances, presumably treating of the rites in Algiers. 9. "Seder ha-Mishneh leha-Rambam," didactic poem, ascribed to Duran in MS. Poc. 74 (Neubauer, "Cat. Bodl. Hebr. MSS." No. 1971). 10. "Perush ha-Ketubbah weha-Geṭ," on marriage contracts and divorces, Constantinople, c. 1516-48. 11. "Perush Hilkot Berakot le-Harif," commentary on Alfasi's "Berakot." 12. "Perush Masseket 'Eduyyot," commentary on 'Eduyyot. 16. "Remaze Pisḳe Niddah" (distinct from No. 4). 17. "Taḳḳun ha-Ḥazzanim," of which the title only is known. 18. "Taḳḳanot ha-Rashbaẓ," inserted in part ii. of the responsa, (19), and in Judah 'Ayyash's responsa, entitled "Bet Yehudah," Leghorn, 1746. 19. "Tashbaẓ," 802 responsa in three parts, Amsterdam, 1738-39; title ed., ib. 1741. Kaufmann, in Monatsschrift, xli. 660. Son and successor of Simon b. Ẓemaḥ Duran; born in Algiers about 1400; died there 1467. In his youth he became familiar with the Talmud and rabbinical literature, and with a resoluteness remarkable for his time he protested against the Cabala. Like his father, he was the author of many responsa (published in Leghorn, 1742); his letter, written in the language of the Talmud, to Nathan Nagara in Constantine has been separately reprinted, with an index of passages ("Kerem Ḥemed," ix. 110 et seq.). His defense of the Talmud, written in 1437 against the attacks of the convert Geronimo de Santa Fé, appeared under the title "Milḥemet Ḥobah," and also the title "Setirat Emunat ha-Noẓrim," after the second part of his father's "Ḳeshet u-Magen." It was also published separately at Leipsic in 1856. His treatise "Tiḳḳun Soferim," which has frequently been ascribed to his father, is printed as an appendix to the work "Yabin Shemu'ah," Leghorn, 1744. A dirge written by him has been preserved in manuscript. E. N. Adler, in Jew. Quart. Rev. xii. 147. Rabbi in Algiers, where he died after 1593; great-great-grandson of Solomon ben Simon Duran. In addition to some responsa, which have been added to Simon ben Ẓemaḥ Duran's collection, he wrote a detailed commentary on Proverbs, which appeared under the title "Ḥesheḳ Shelomoh," Venice, 1623; six discourses on the seven kinds of wisdom; a commentary on the book of Esther; and a treatise on temperance, All these works were completed by the year 1591, and published under the title "Tif'eret Yisrael," Venice, (c. 1596) (Roest, "Cat. Rosenthal. Bibl." pp. 494 et seq.). Father of Simon Duran; went from Provence to Palma, and thence to Algiers, where he died in 1404. He had some knowledge of medicine and astronomy, and was preacher at Algiers ("Rev. Et. Juives," xlii. 277). Great-grandson of the preceding; died 1590; author of a commentary on a liturgical poem for Purim by Isaac b. Ghayyath. This poem, with the Aramaic text, was printed in "Tif'eret Yisrael," a work written by his son Solomon b. Ẓemaḥ Duran (Roest, "Cat. Rosenthal. Bibl." Appendix, p. 494; Steinschneider, "Cat. Bodl." p. 2761). Talmudist; died Sept., 1604; was mourned in an elegy by Abraham Gavison (Nepi-Ghirondi, "Toledot Gedole Yisrael," p. 49). 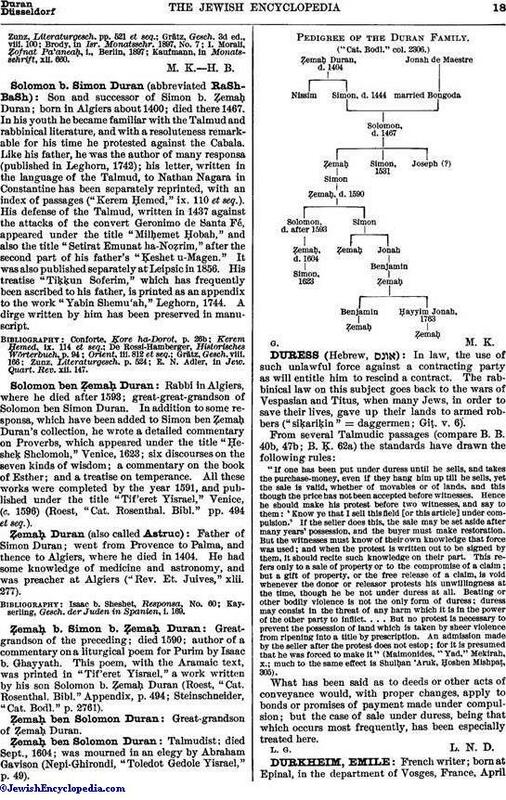 Pedigree of the Duran Family.("Cat. Bodl." col.2306.) G. M. K.